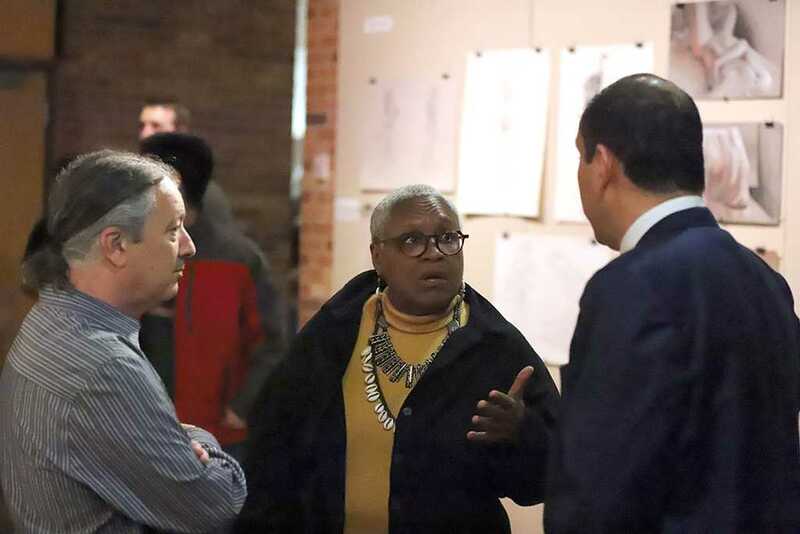 The Juanita Harvey Art Gallery welcomed about 50 attendees to Dallas artist Vicki Meek’s gallery opening of her show Vulnerable on April 6. Meek focused her latest pieces on her recent surgery and unpredictable health status. More than just the surgery itself, Meek focused on the unexpected hardships and the “sudden had-to-deal-with stuff” that accompany healing that shocked her inspiration. Throughout her work, Meek carefully decided which materials would best represent the concept of vulnerability to her audience. Every piece represented a step throughout the process of her journey, not only spiritually but emotionally, and Meek said art like this helps relate to people on a deeper level. Although Meek said her work does not normally focus on her, she felt this was a great way to cope with what was going on in her life. 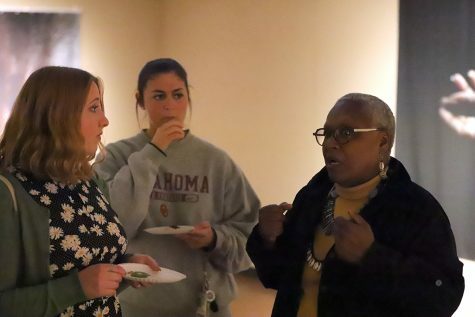 With the Midwestern’s well-known nursing program, she believed the Fain Fine Arts building on campus was the best place to have her gallery opening. To Meek, her goal as an artist is to inspire her viewers to find a deeper meaning in everyday activities, challenges and struggles. Gary Goldberg, professor and gallery director of the Juanita and Ralph Harvey School of Visual Arts, said he was excited for Meek to hold her show at the university due to the reputation of her work. Blake said she feels she will be going to future galleries after seeing how much Meek’s gallery opened her mind. Events like this allow more students to experience the artists throughout campus, and Goldberg said he encourages students to come out to the next gallery opening due to its numerous perks.